You Are Here Craft Invaders » CRAFTS » Craft Tutorials » Ten top tips for Making a Gingerbread House. Christmas is coming, and Gingerbread Houses make a lovely festive centrepiece. They can, however, be frustrating and fiddly to make. 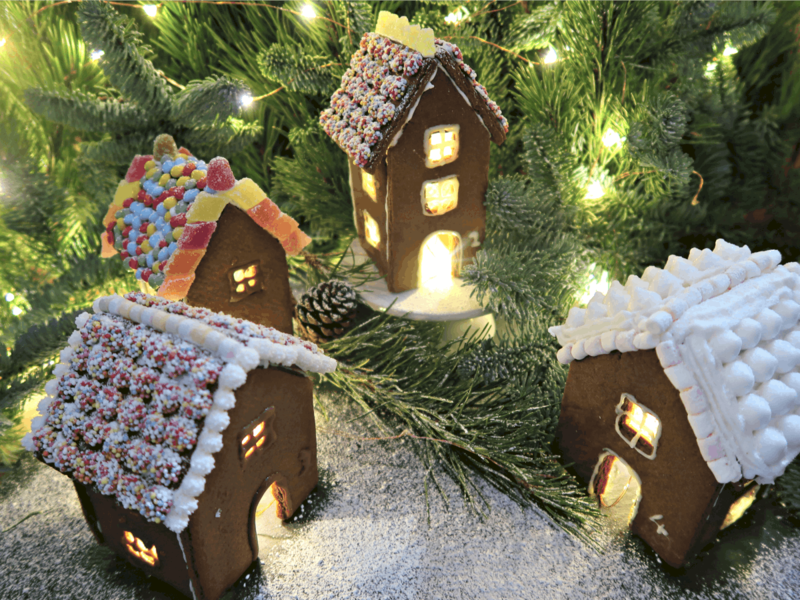 So here are our ten top tips for creating a stress-free Gingerbread House. 1. Roll your dough between 2 pieces of baking parchment to stop it sticking or cracking. 2. Dipping your cutters in flour between cuts will help stop them sticking to the dough. 3. Remove the trimmings from around your gingerbread house cut-outs leaving the shapes on the baking parchment ready to cook – this is much easier than trying to transfer the biscuits themselves. You can then slide the paper straight onto the baking tray to bake. 4. Before baking, pop the cut-out gingerbread dough and baking sheet into the freezer for 15 mins – this will help stop the dough spreading during cooking. 5. Don’t underbake your gingerbread house. It should be nice and crisp for building with – the biscuits should be hard and break with a snap. 6. To create glass windows melt boiled sweets or Isomalt (available from baking stores) in a small jug in a microwave (10-20 seconds at a time) and pour carefully into the window cutouts while still on the baking sheet. Remember melted sugar is extremely hot! 7. When your gingerbread is cool using a sharp knife to tidy up any edges will give them a smarter look and make it easier when you come to assemble the house. 8. Royal icing makes an excellent glue for gingerbread houses. Using a squeezy bottle with a piping nozzle makes a fab alternative to a piping bag, and we find them a lot easier for the kids to use. You can leave the icing in the squeezy bottle between each stage. If the icing becomes too firm, simply unscrew the piping nozzle and microwave the bottle for 10 seconds to soften. 9. Decorating each element of the house before assembling is far easier than trying to fight gravity. 10. Don’t rush the assembly. Royal icing needs a minimum of four hours to dry. Ideally, assemble your walls one day and leave to dry overnight before adding the roof. Supporting each element while it hardens is also a good idea. You can find our recipe which works well for both a gingerbread house and biscuits here. We hope you find our top tips helpful, if you have any of your own, please share them in the comments below. Thank you for sharing these wonderful tips! Your houses are lovely and festive. When I lived in Holland I made gingerbread houses each year and used Jolly Rancher candies for stained glass windows. I just baked them along with the gingerbread on parchment. This post has me in the spirit to get baking again! Great tips! Wish I had seen these a few days ago when we made 3 houses. We finished them but these tips would have made things a whole lot easier. Thanks Julie – they can be a bit tricky can’t they? 3 houses is a labour of love!